It seems that the further down the chain of PC components, the more companies there are to produce the hardware. For desktop PCs we have two main CPU manufacturers, three main GPU manufacturers (including Intel), half-dozen mainstream motherboard manufacturers, about the same memory manufacturers (many smaller ones), a dozen storage manufacturers and a couple dozen main chassis manufacturers (with even more getting involved in CPU cooling). 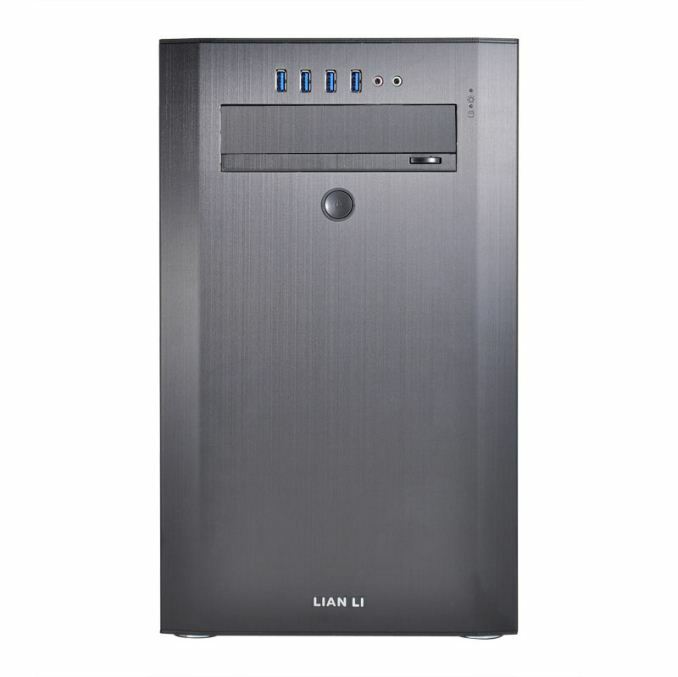 To this extent, more competition requires more innovation and brand recognition to differentiate the company: over the past several years, we have seen Lian Li come out with a variety of unique case designs, and the PC-A51 today is a little more conservative in that respect. The PC-A51 is a 44 litre ATX mid-tower design suitable for CPU coolers up to 175mm (6.8”), 160mm (6.2”) PSUs and 400mm (15.7”) GPUs. The brushed aluminium commonly associated with Lian Li is here, with a side window on the PC-A51WX and PC-A51WRX models. The chassis comes in at 4.9 kg, measuring 230mm*393mm*489mm (WxHxD), with space for five storage drives (2.5” or 3.5”) in the main section and two 2.5” drives in the cable management area. 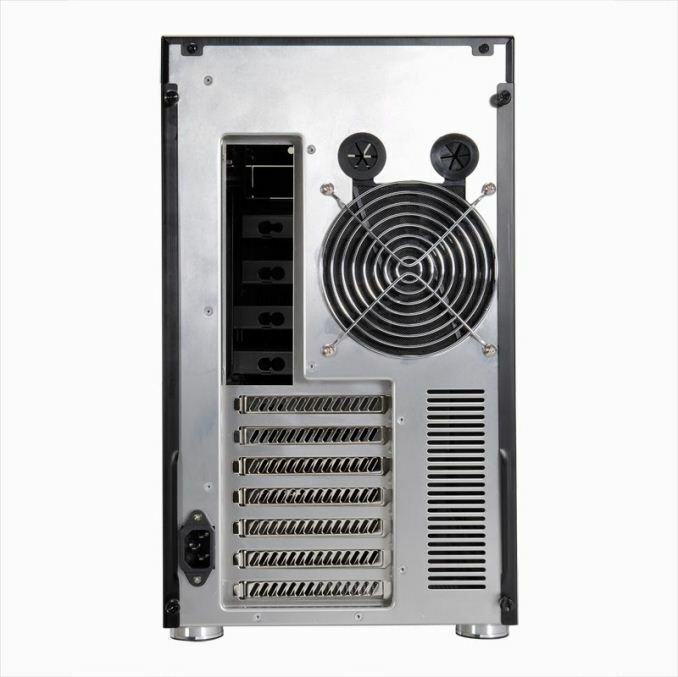 The thermal design is based around a reverse airflow system – air comes in through the rear 120mm fan, passes through the CPU cooler (make sure it is mounted the right way, this should also give the bigger temperature delta between hot/cold), and through the storage drives out the front panel ventilation holes. 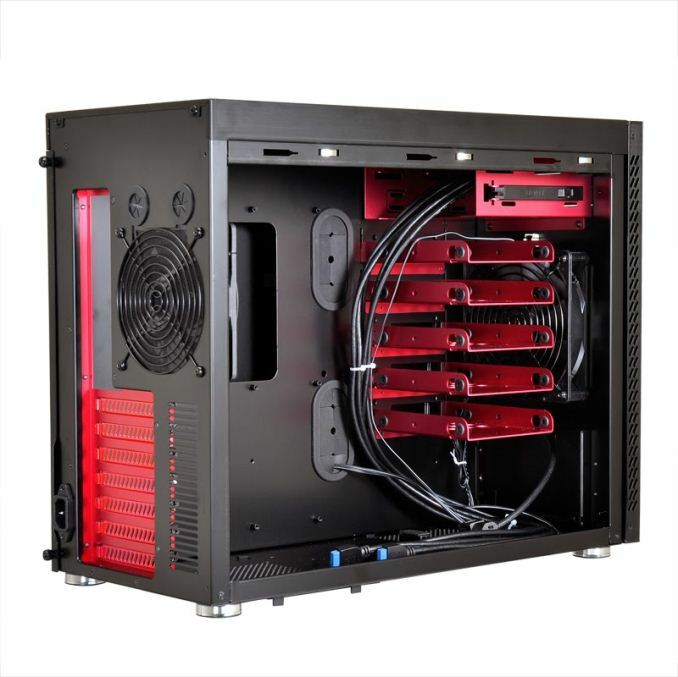 The system also has liquid cooling grommets and space for a 240mm/280mm radiator on the top. This layout is a little odd, as the intake of air comes above the outtake of the GPU airflow, suggesting that warm GPU air will come in at the CPU level, re-entering the case. 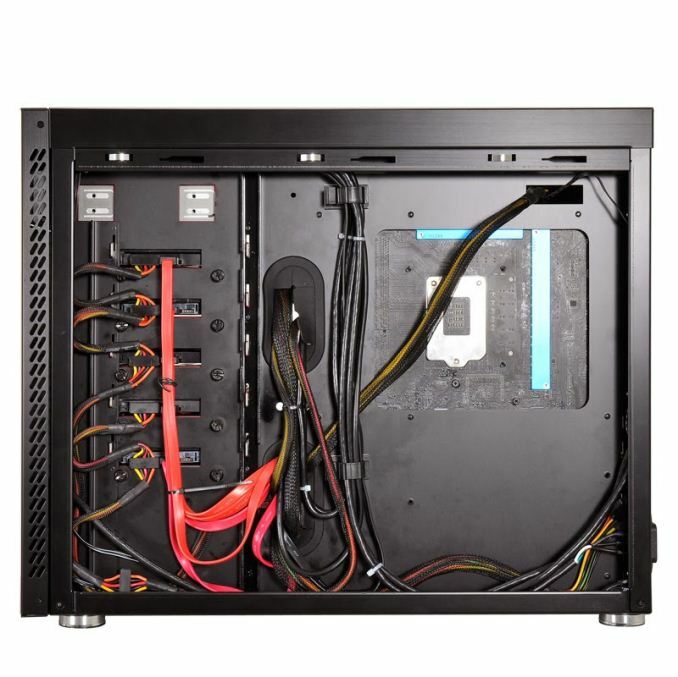 The chassis is also designed for a front mounted PSU, with an internal cable being routed through the 30mm of cable management space behind the motherboard. Two of the storage bays have to be removed for an initial GPU longer than 280mm, and GPUs beyond the first have a 280mm limitation depending on the PSU. The chassis is a tool-less design, with the front panel featuring four USB 3.0 ports, audio jacks and space for one 5.25” drive. As seen in the images, these four USB 3.0 ports use two cables rather than a hub, meaning that in order to get full use of these ports, the user needs a motherboard with at least two USB 3.0 headers. This combination is commonly found on the more expensive Intel 8-series motherboards that advertise 10 USB 3.0 ports or more. The PC-A51A (silver, no window) and PC-A51B (black, no window) will be available in North America from the end of February at an MSRP of $149. The PCA51WX (black, window) will be released at the same time for $189, and the PC-A51WRC (red and black, window) will be available in April at $199. Except it has worse temps that way around. Your intake air is hitting the HDDs first and being impeded by the drives & cages resulting in less cool air on the CPU. Also the front intake will be fighting with the PSU exaust.